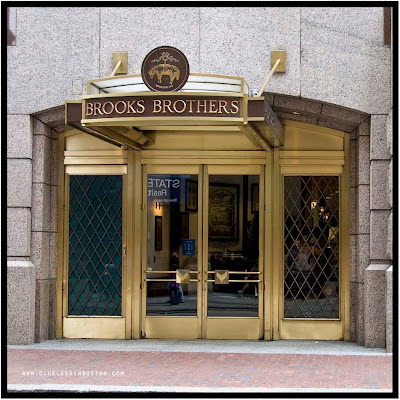 This week's doorway is the Brooks Brothers store on State Street. Very classy and I like the reflections. What do they sell? A golden door!.. Like Ciel, I'm wondering what they are selling..Something expensive , I think, the shop is so elegant! Ciel and Malyss: thank you for visiting. As for your question, Brooks Brothers sells dress shirts, ties, pants, and sweaters, primarily for men. Their styles are "classic," which means they are not trendy and au courant, and so will not quickly go out of style. A very luxurious B.B all in gold!! Are the shirts more expensive in that one!!! Very charming door and I loved the reflections, wonderful shot! Cool classic photo of a classic. BB was so big in the 80's. (Of course, it was big before too. )Remember "Dress for Success" craze? The little bow ties for women? I'm glad the company is still in business - I actually bought a sweater set at the one in St. Louis airport.